BillHendricks.net: Do You Want a Computer Telling You What to Do With Your Life? Do You Want a Computer Telling You What to Do With Your Life? Myers-Briggs. DISC. StrengthsFinder. AIMS. There are hundreds of assessments available nowadays. Which one is the best at helping you understand who you are? You might be surprised at the answer. With the rise of knowledge work in the mid-1900s, it became apparent that each of us creates value in a different way. You might be great at working with data, but the person next to you isn’t. However, they sure know how to sell a product, which perhaps you don’t. Likewise, someone else might excel at organizing tasks, while a coworker can’t find his way out of bed in the morning. However, that seemingly “disorganized” person is a genius at writing code. So how do any of us figure out what we should be doing with our lives? Well, that’s why we now have a whole industry devoted to what is called “assessment.” There are hundreds, possibly thousands, of personality inventories, psychological profiles, preference questionnaires, and other assessments on the market. So which test is the best at helping you find out what your giftedness is? (1) Virtually all assessments are inherently subjective. A. do research and look for information to help me figure it out. B. ask someone else how they would do it. C. act as if I do know what I’m doing and just get through the situation. Whichever option you select, it will contribute to the inventory’s overall description of you that will come together in a report. That report may look very impressive. It might include graphs and charts and scores and percentiles. It might even give you lengthy paragraphs that describe how you tend to behave or feel. All in all, it may come across as very scientific, analytical, and objective. But is it? 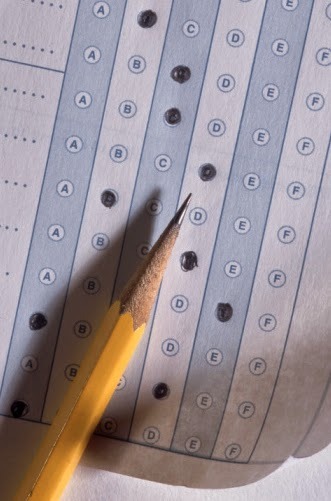 Consider this: the objectivity of a test is not determined by how it reports its findings, or even whether a computer algorithm was involved in the analysis. It all depends on where the information comes from in the first place. So where did it come from? It came from you. When you answer an inventory question, you are self-appraising. You are telling the testing people whatever you end up telling them, based on your own self-insight (or lack thereof). The assumption is that you know yourself well enough to accurately answer the question. But what if you don’t? And what if you fudge on an answer? What if you check a response that you know isn’t really you? After all, you may have reasons for wanting the test to come out a certain way (e.g., to get a job, to get accepted into a program, to come across a certain way to potential love interests, etc.). For that reason, some test designers put questions in their tests to assess how “truthful” someone is being. But to me that’s an admission of an essential flaw in psychometrics: they are inherently subjective, because their data is based on self-reporting. (2) Virtually all assessments are comparative. Ultimately, that approach leads to placing you in a category of people and assigning you a label that supposedly describes you. Is that designation helpful? Somewhat. But only somewhat. It gets you in the ballpark. But it doesn’t tell you how you uniquely play your position. Consider the widely popular Myers-Briggs Type Indicator (MBTI). It sorts people into sixteen different “types,” or preferred ways of perceiving the world and making decisions. Once you discover your type, you know what makes you different from people in the fifteen other type categories. But what distinguishes you from the people in your own type? For example, let’s say you’re an ESTJ (Extroverted-Sensing-Thinking-Judging). ESTJs comprise an estimated 8.7 percent of the population of the U.S. That’s 27.3 million people. Extrapolated to the entire world, that’s 613 million people. Your giftedness is unique to you. So if tens and even hundreds of millions of other people are the same “type” as you, does figuring out what your type is nail down what your giftedness is? I think not. I have nothing against Myers-Briggs, or any of the other assessments that are comparative. I’ve occasionally worked with some of them myself, and I think they offer some interesting insights into human interactions. I just don’t see them getting down to the individual/personal level, which is where your giftedness lies. In the end, what matters is not not how you compare to other people, but rather what distinguishes you from other people. What makes you uniquely you? (3) Virtually all assessments are quantitative. One of the underlying assumptions of the assessment field is that people and their behavior can be quantified. That’s because so many of the assessments that are out there are based on a psychological model of some sort. Psychology is a science, which means it has a bias for (if not an exclusive commitment to) quantifiable data. In other words, the premise on which those assessments are based is that people are quantifiable; we can be understood best through measurements, numbers, and equations. But who says we are? And even if we are, who says that numerical measurement is the only way or the best way to understand us as human beings? Let me put it this way: so many of the great and abiding and universal themes of the human condition—love, bravery and courage, loyalty, community, faith, a preference for beauty, morality, gratitude, generosity—are inherently qualitative, not quantitative. That may be so (i.e., there’s no doubt that the body gets involved in love). But as a practical matter, no one lives as if that were so, or that those physical processes are “all" that love is. Anyone who went home and told their spouse that his/her love for them was “nothing but” a physio-chemical reaction would probably not be with their spouse for much longer. No, there is clearly a whole dimension of human beings that goes beyond the quantitative. I happen to believe that we humans are a body-soul unity, which means we have a material dimension (observable by empirical, quantitative means) and an immaterial dimension (which must be ascertained in other ways). What would be another way? Well, in my last post, I pointed out that your own life story yields plenty of clues as to how you are wired. Certain activities you’ve done that you enjoyed doing and did well reveal a remarkably consistent pattern in the way you function, or “do life.” That pattern describes your core strengths and natural motivation. As a result, it’s remarkably predictive in terms of career success and satisfaction. I have a free resource available at my website to help you engage in that inquiry, called Discovering Your Giftedness: A Step-by-Step Guide. You can certainly take a test instead, if you like. Tests tend to be fast, inexpensive, and scalable—just what industry likes. Maybe you’ll like that approach, too. But the question you’ll have to decide is: do you really want a computer telling you what to do with your life? Question: What has been your experience with personality tests, inventories, and assessments, and how have they helped/hindered you in understanding the core of who you are? NEXT POST ON BillHendricks.net: What We Can Learn from Steve Jobs?